Alice in her racist bikini. And I did think that. I did. In my mental universe, it was possible to be both an American and a Southerner. I thought that the confederate flag bespoke another layer of identify, not an alternate one, that the two were not mutually exclusive. I thought that until June 17, 2015 when yet another twisted excuse of a loser gunman mowed down nine innocent people in a black church in Charleston, South Carolina and my mental universe shattered into pieces. I grew up with the confederate flag. I was comfortable with it. To me it connoted mornings when nothing could be finer than to be in Carolina. It meant an actual Spring as opposed to the Canadian version of that season – i.e., that time when the snow retreats ever so slowly to reveal a winter’s accumulation of discarded cigarette butts and oddly mummified dog poop. It meant dogwoods and azaleas and blossoms blowing through the air and sun tanning in March. I’m talking principally, I realize now, about weather, specifically good weather. 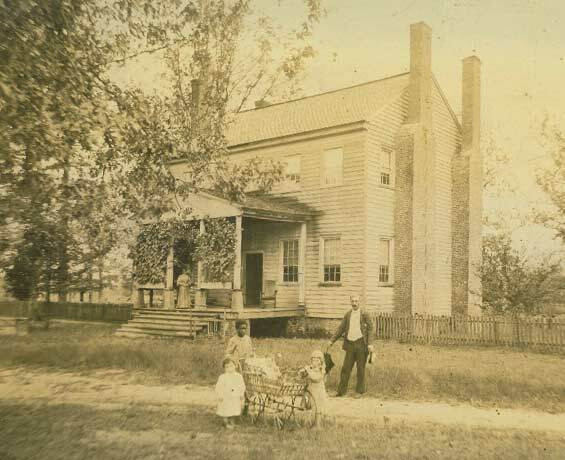 To me the confederate flag meant good weather, and good weather meant home. As an ex pat who has spent the vast majority of her adult life in the True North Strong and Free, I retain considerable nostalgia for the mild climate of my native North Carolina. 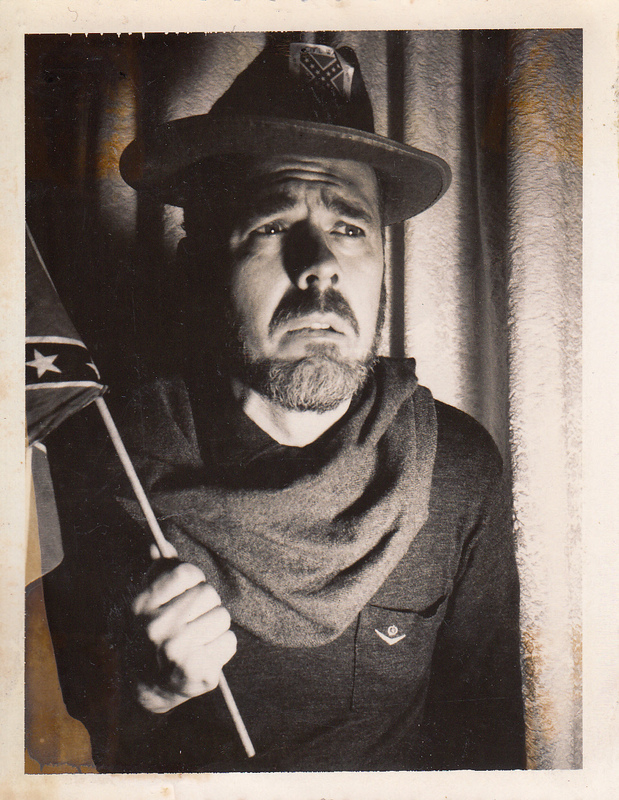 My father, Bill Hardy, mugs for the camera in Confederate regalia in the mid-sixties. I was raised by liberal, educated parents in Chapel Hill, a progressive college town in a deeply conservative state. I handed out fliers for LBJ in the predominantly black town of Carrboro and volunteered as a teacher’s assistant at a Head Start program held in the basement of a black church. I was that kid. But the truth is, I was another kid as well – some screwball version of a Southern belle. I had no clue about the magnitude and pervasiveness of Jim Crow law. I had no clue about the history of slavery or, for that matter, of the United States. I bought hook, line and sinker the whole Romance of the South thing as perpetrated by Gone With the Wind. In fact, my knowledge of the Civil War and Reconstruction derived almost entirely from that novel, which I read not once, not twice, but five times. My favorite color is green not because I’m an environmentalist but because that was Scarlett O’Hara’s favorite color. In other words, I, like so many of my fellow Southerners, was capable of holding in my brain two dichotomies: I was a staunch supporter of civil rights and I was a true daughter of the South. The truth is that the Romance of the South was, at best, a tawdry one. There was nothing gentile about the institution of slavery. No beneficence was involved, nothing noble, or gracious, or fine. Slavers and the people who kept them in business – my ancestors among them – weren’t a whole heck of a lot different from Boko Haran, save for the fact that Boko Haran perpetrates its crimes in the name of religion and slavery was predicated on filthy lucre. As the fallout from the Charleston massacre has demonstrated, the confederate flag is not all in good fun. Not by a long shot. As for that jumped up little cracker who took all those good peoples’ lives, I’m glad their loved ones can forgive him, because I sure as Hell can’t. I’m having a hard enough time forgiving myself. 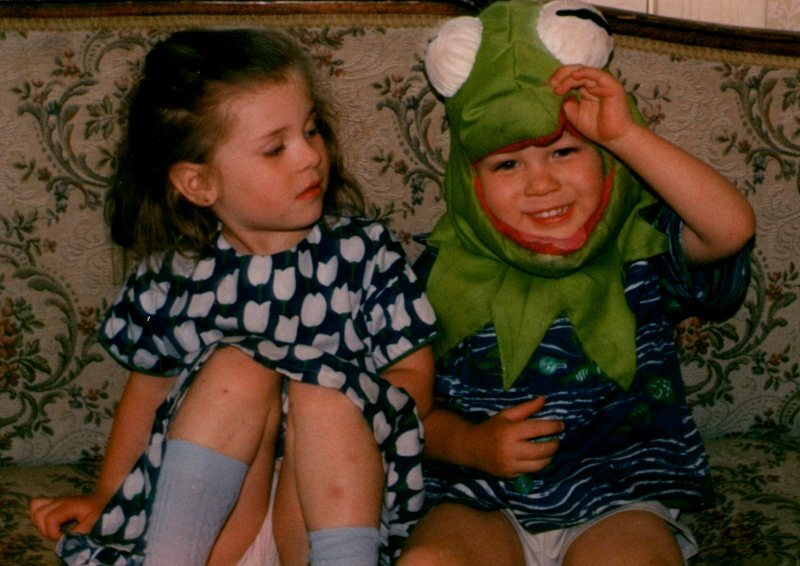 Will at about the age of his disappearance, wearing a Kermit the Frog head. His twin Alice looks on, askance. 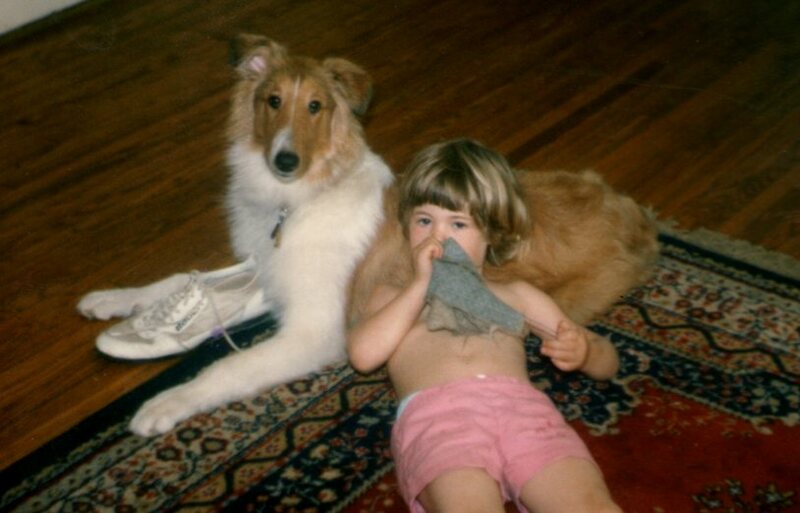 When my son Will was a toddler, he was kidnapped. Or he ran away. In any case, one sunny summer afternoon my ex and I glanced up from our work in the garden to find Will nowhere in sight. We panicked. While I stayed back in the yard with the girls, breathing via a paper bag, my ex careened around the neighbourhood, flailing his arms and shrieking, our collie, confused but psyched, in hot pursuit. Neighbours joined in, some on bicycles to broaden the search area. I called the police. Then, about a half an hour in, Paulie, the dozy pre-K grandson of our next door neighbour, jerked to sudden life and decided to share. “I saw where Will went,” he said. Now Paulie was a pathetic child – strangely boneless with a thin face and lank hair. Rheumy eyed and snot encrusted, he looked like he subsisted entirely on a diet of Cheetos. But it wasn’t just Paulie’s desperate appearance that rendered him piteous. It was everyone’s palpably low regard for him. My children, being children and therefore without mercy, thought him very weak tea indeed, but so did his family. “Oh, Paulie!” they would cry with thinly veiled contempt. Paulie couldn’t do anything right and he knew it. Emerging from his brief myotonic episode, Paulie shuddered convulsively. Then he turned thoughtful. “Well,” he began. He paused and began again. “Well, he came down those steps.” He pointed to the front steps of our house. “He came down the walk . . . .” Paulie indicated the walk the front stoop to the sidewalk. Paulie furrowed his brow and screwed up his mouth. He cocked his head to one side and glanced down at his battered flip flops. His eyes widened as if he was seeing his toes for the first time. The grownups joined in a rousing chorus of encouragement. “Oh, Paulie!” everyone cried, turning away in disgust. That was when the police showed up, followed shortly thereafter by Will. He appeared in the front door, theatrically rubbing his eyes and claiming to have been asleep under a desk in his father’s office the entire time. Years later he confessed that he had, instead, watched through an upstairs window as the drama unfolded. Which we, being not entirely stupid, always sort of suspected. As for Paulie, he had been, however briefly, the center of attention, a shining light, a hero in the making, a human being worthy of regard and a source of pride to his family. In a life which, I suspect, would afford Paulie few such opportunities, he saw his chance, boldly seized it and then played it for all it was worth.